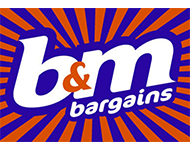 B&M one of UK’s fastest growing variety retailers, we believe in selling Big Brands at Sensational Prices. Our stores attract over 3 million happy shoppers each week. We believe that everyone loves a bargain!